Jasmine is the national flower of Syria. 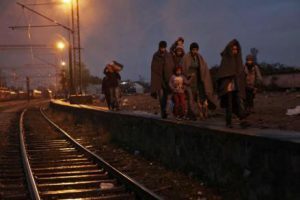 Poet Nahal Navidar writes: "Whispers of Jasmine narrates the exodus of millions of Syrian refugees whose only comfort is the familiar scent of jasmine clinging to their clothes in their long search for a new home." Adolphe adds: "The scent and sound of jasmine is at once a powerful reminder of one's family and homeland yet also an ephemeral scent dissapating in the wind."